It’s been a couple weeks now since I first introduced my 30x30. 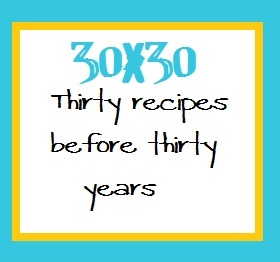 What I didn’t mention at the time was that I was making up my first 30x30 recipe on my birthday! Now that’s starting the year off right! Did I mention that it was the carrot cake? That’s starting the year off even better! I got this recipe from my mom, who got it from a lady at church, who got it from her Ukrainian grandmother (apparently Ukrainian grandmothers make the best carrot cake). And let me tell you, this is one heck of a carrot cake. The cake is super moist with just a hint of cinnamon, and a bit of texture from the carrots and nuts. If you want to wow someone with your first from scratch cake – this is definitely the way to go! *Yes, it really does say 1 ½ cups of oil, just don’t think about it. *If you don’t like pecans, you can use walnuts instead. You could omit them completely, but I wouldn’t unless you have allergy concerns. *Make your life easy – use a food processor with a shredding blade to grate those carrots! Preheat the oven to 350 degrees F and spray three 8-inch pans with non stick spray. In the bowl of a stand mixer, stir together the oil, eggs, sugar, cinnamon, baking powder, baking soda, salt, and flour. Stir on medium until well combined. Fold in the carrots and pecans with a spatula. Pour approximately 2 cups of batter into each pan and bake for 25-30 minutes or until a toothpick inserted into the center comes out clean. Cool the cakes on wire racks for 10 minutes. Then run a knife along the edges and remove the cakes from the pans. Return to wire racks until cooled completely. To make the frosting, place the cream cheese into the bowl of a stand mixer and beat until smooth. Add the butter to the cream cheese and cream together. Add the vanilla and powdered sugar and stir on low until combined and smooth. Frost the cake and garnish with additional with pecans, if desired. A perfect way to celebrate your birthday and the first 30x30 post! It looks soooo tempting :) Happy Birthday, Amy! This looks so truly decadent. I love carrot cake! Carrot Cake!! YUM!! This looks heavenly!! What beautiful photos! All of those layers are making me drool - looks delicious! Mmm, what a pretty cake! :) Kudos for the decoration skills! A real traditional cake , you can put little variations to this cake ,such as adding orange to give a little zesty taste.These cakes can also have several layers depending on how large or what you would like on the layers. Nice recipe and keeps going .